One of the most frustrating habits kids have is peeling name plates off of tables. Not to mention the gooey residue left behind from adhesives used to prevent this from occurring. This name plate is designed to go on a student's pencil box lid (outside or inside) where it is always accessible and harder to pick at. And, no sticky residue on your tables! 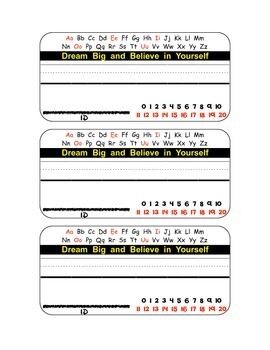 Included on these tags are references for student name, student ID number, alphabet (capital and lowercase), and numbers 0-20. I attach these tags to my student's pencil boxes using velcro so that if they need their ID number to get through the lunch line or log into the computer, they can peel it off of their box and take it with them outside the classroom.